Send our traditional meat lasagna, hand layered with seasoned ground beef, pasta, Mozzarella, Ricotta, Monterrey Jack, Parmesan and Romano cheeses. 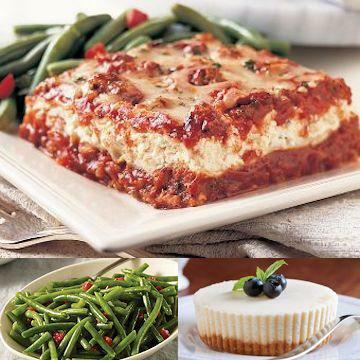 Add a side of crisp green beans, then conclude with four Individual NY Cheesecakes, and you've got the perfect meal. Meal serves 3-4. From Frozen:�Oven: Preheat oven to 350�.Carefully remove film from tray before baking. Place frozen tray of lasagna on a baking sheet in the center of the oven. Bake 55-60 minutes or until internal temperature reaches 165�F. Remove from oven and let stand 5 minutes. Slice and serve�Microwave: Remove tray from box and cut small slit in center of film. Place frozen tray in microwave and cook on medium high for 9-10 minutes or until internal temperature reaches 165�F. Remove from microwave with oven mitts and let stand 5 minutes. Carefully remove film, slice and serve.�From Thawed. Thaw in refrigerator overnight.Oven: Preheat oven to 350�.Carefully remove film from tray before baking. Place tray on baking sheet in the center of oven. Bake 35-40 minutes or until internal temperature reaches 165�F. Remove from oven, slice and serve.Microwave: Remove tray from box and cut small slit in center of film. Place thawed lasagna in microwave. Heat on high for 4-5 minutes or until internal temperature reaches 165�F. Carefully remove film, slice and serve.